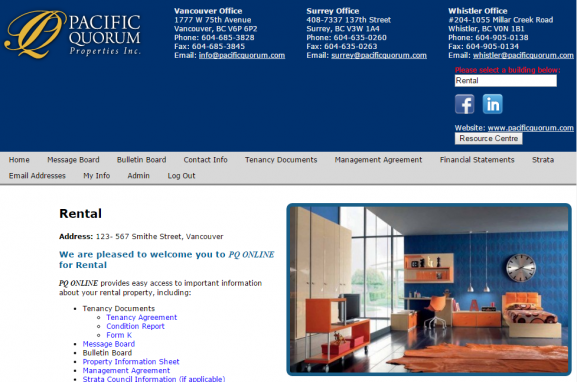 PQ ONLINE offers Pacific Quorum’s rental owners easy access to important information about your investment, in an effort to enhance efficiency, communication, and convenience. Please review the below information for all features included in PQ ONLINE-Rental. Message Board: Interactive message board which allows 2-way communication between rental owners and their property manager. Messages are automatically archived for future reference. Bulletin Board: Online access and email notification of notices issued by your property manager. Contact Info: Online access to your property manager and accounts department contact information. Management Agreement: Electronic access to your management agreement with Pacific Quorum.